Description: It allows you to safely and reliably eject your removable drives. Without ejection, removing a drive can harm your data and the built-in "Safely Remove Hardware and Eject Media" feature of Windows often fails if you have open files on the drive. 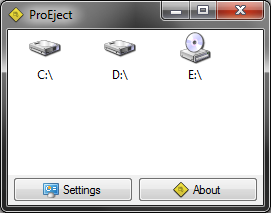 In addition, ProEject cleans traces of the drive in the registry and local directories, flushes the contents of open files, and closes all drive applications running before ejecting.